This home has no storage space outside in the backyard. The electric lawn mower I use, is currently stored indoors in a room on this level of the house. My husband placed some shelving outside here years ago to store some gardening supplies. Basically these shelves look tacky and the dust storms we have, put a layer of dust on everything stored here. 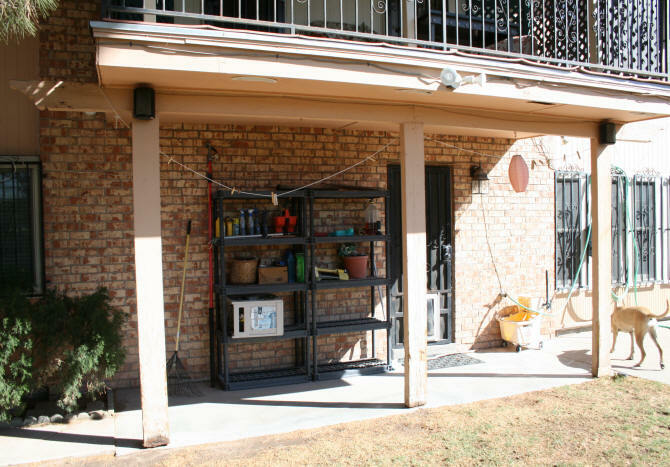 I wanted to create a storage shed here under the balcony to store the lawn mower and other gardening supplies. I first needed to measure the space to see what size would work. 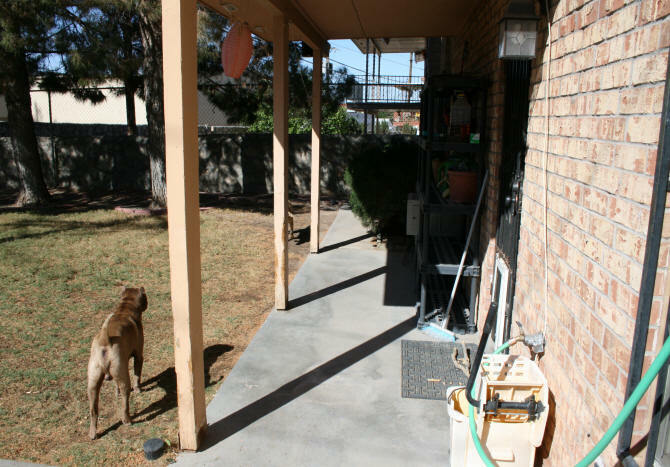 I decided on a width of 7 feet and a depth of 34" which just leaves enough space to walk on the shallow patio. The walls of the shed will go up to the ceiling which will eliminate the need for a roof. The height is around 100", after making a base for the shed, the walls will only need to be around 96", perfect size for an 8'- 2" x 4". Any gaps at the top will be covered with some moulding I'll add between the shed walls and the ceilings. 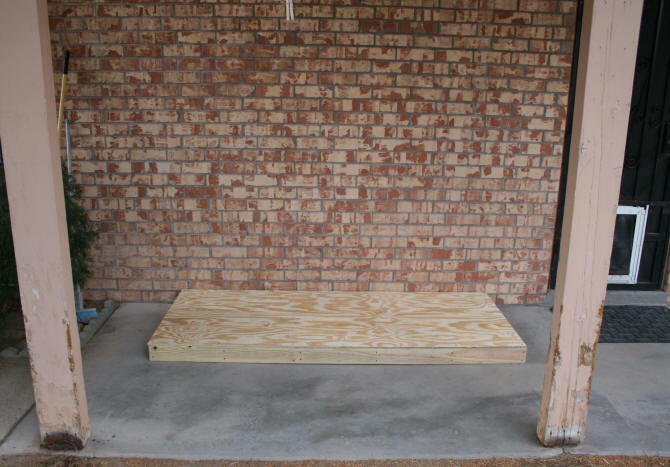 The first thing to do was to make the base of my storage shed and the flooring. For the base I purchased four pressure treated 2 x 4's, 8-feet long. Why pressure treated? I wanted the base to have a little extra wood protection in case the water got on top of the patio, which it usually does during a hard rain storm. I also plan on putting some pvc trim along the bottom and sealing it with silicone to further protect the wood. I cut two pieces 7' long. On the 7 foot pieces, I drilled starter holes for the nails and screws that went into the corners. I then placed two of the shorter pieces on the corner and used my squaring triangle to make sure everything was square and clamped them together. I then put two 2 1/2"screws in each corner. I then nailed the other four shorter pieces in place with 2 1/2" nails. I then cut a piece of 15/32" plywood 7' x 34" and nailed it on top of the frame. 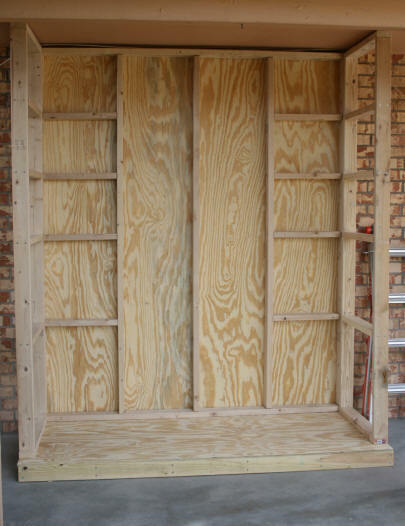 April 7, 2014 - I completed the frame for the back wall of the storage shed. It is not attached yet and is just sitting on the base. I need to put some thin plywood on the back of the frame before I attach it to the base. 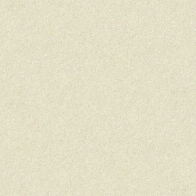 In the picture, the frame looks bowed but it's not. I used all 2" x 4"s The height of the frame is 95-1/4". I was going to make it an even 96" but realized that the balcony above has a slight slant to it, to drain water. 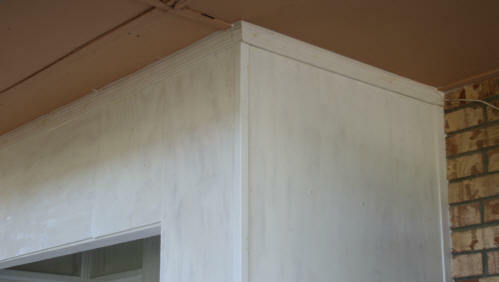 When I place moulding at the top of the shed, it will cover the small gap. The odd spacing of the cross beams is going to be used for the shelving I will be installing. The three pieces going across at the top are spaced equally. The bottom shelves allows more space for any large heavy items. Plywood added to wall side of back frame April 8, 2014 - Added the plywood to the back of the back frame and fastened the frame with 2 1/2" screws to the base. If it looks like there are different pieces of wood nailed on the back, you are correct. At the hardware store, I had them cut down the two 1/4"- 4' x 8' pieces of plywood to fit behind on the 2 x 4's. Everything I buy, has to fit inside my old 2001 Mitsubishi Montero. Also, I have a heck of a time trying to rip a piece of plywood on my table saw by myself. I can just fit the 8' length which extends into the head area of the SUV. Which means I am driving hunched down and blind except for the windshield and left side mirror. I have found a path home from the hardware store where I do not have to make any lane changes to the right. April 9, 2014 - I made the side frames today and attached them to the base and back frame. The horizontal 2" x 4"s on the side frame have the same placement as the back frame to add extra support for the shelves I will be adding. The width of the sides is 27" wide and 92 3/16" high. 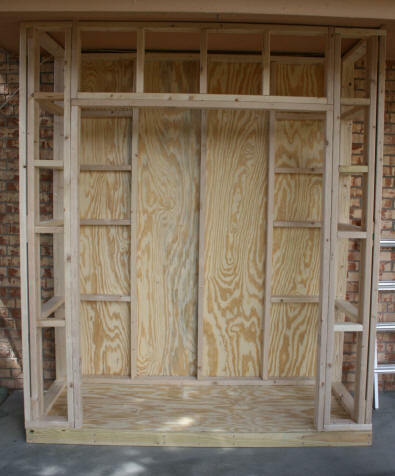 The next step will be to cut the pieces and assemble the frame for the front of the shed. 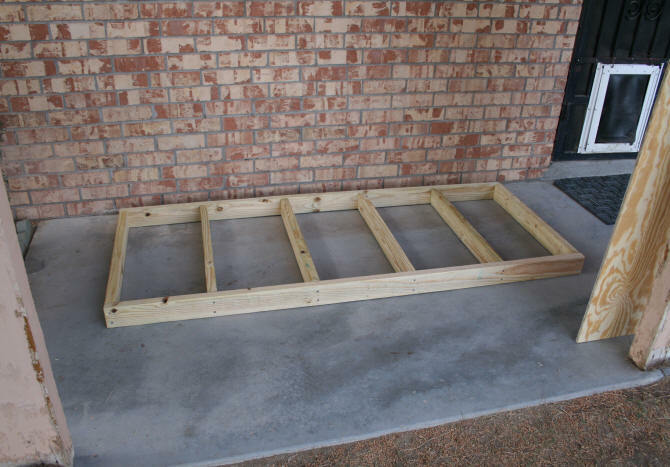 April 10, 2014 - I completed the front frame today and attached it to the sides and base. The front was done in three parts. The first part was the two corner sections. Again the horizontal 2" x 4"s mirror the side and back frame for the shelf support. Front frame complete The second part was the framing around the doorway. Two 2" x 4"s were nailed on the side. A third 2" x 4" on top of the two. The height of the doorway is 76". The width is 56 3/4". The third part was the over the doorway framing. The front framing was all done in parts because I wanted to make it easier for myself. I struggled a lot with the weight of the back section when I moved it into place. I have made the door wide so it will be easier for the lawn mower to be placed inside without collapsing the handles every time. There will be two doors that swing out. the plywood first. I had wanted to get a more durable material for the outside like the siding that is a composite with cement. I even found some 5" snap together PVC strips. The hardware store does not cut the composite siding (so I would not be able to get it home) and the PVC strips were too expensive. So I settled on the same 15/32" plywood I used on the floor. The plan is to paint it properly including the edges. I will be using an oil based primer and then a durable latex outdoor paint. While these will be drying, I will start painting the inside of the shed also. I did however splurge on the PVC trim I will be using along the base, corners, and top. If you are ever shopping for PVC moulding, it is not with the wood moulding. At the Lowes I visited, the PVC moulding was in the window section. April 14, 2014 - All of the wood was painted a coat of oil based primer. The walls of the shed were nailed on. The PVC base trim boards were placed on first, before I nailed on the walls. The reason for this was the warped plywood. It is almost impossible to find a straight piece of wood at the big box warehouse stores. I first nailed the trim in place, then set the walls on top of the trim, then I used clamps to hold the warped plywood against the 2" x 4"s of the frame and nailed the plywood on. As I moved around each piece of wood, I adjusted the clamps. April 15, 2014 - My computer hard drive crashed. Still looking for a replacement drive or a fix. HP was not very helpful regarding where to buy a replacement drive. They could not get me off the phone fast enough. Curious is the fact that the hard drive crashed exactly 5 years to the day I bought the computer. As if there was a timer inside saying CRASH! CRASH! ....so she will buy a new one. Not from HP, I'm not!! Moulding in place and sealed with silicone April 16, 2014 - Today I added the moulding to the top underneath the ceiling. the corners and wall where the sides meet the brick. The goal was to cover all of the gaps where water could get it. All of the trim is PVC except for the trim on top, which is pine moulding. All of the nails were countersunk and the holes were filled. Silicone sealant was added to every edge of the moulding. When the base trim was added, a lot of clear silicone went on the bottom also. For the door frame, I bought some 1" x 4" white boards that still need to be primed and painted. I will place them on after the shed is painted the color you can see on the base trim. Next step is to paint the shed 2 coats of paint, make the shelves, and doors. April 23, 2014 - The last few days were spent cutting the shelves, making the door frame, and getting everything painted. 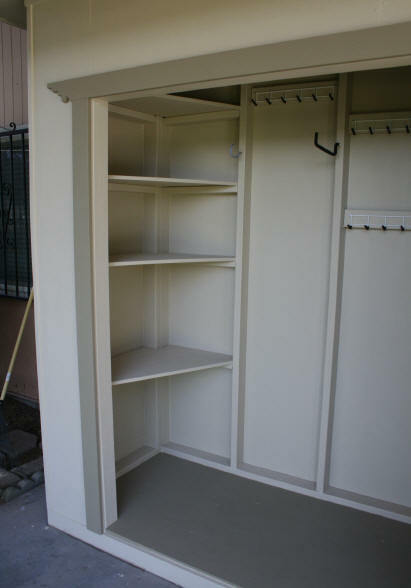 The shelves that were made, are custom fit for this shed. They are not rectangular. The problem was, the front part of the shed was narrow. If I had just made rectangular shelves that fit between the 2" x 4"s, the shelves would have been very narrow. Not much can be stored on skinny shelves. I first made a shelf template out of some cardboard from a box. I then fit the template in place, tweaking the size as needed. The template was then placed on the wood and the outline traced. I then made the cuts using my table saw. 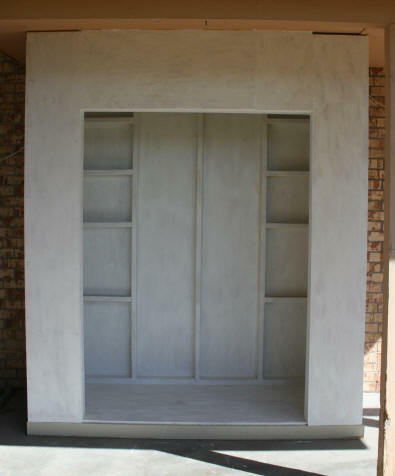 The photograph below shows two of the shelves after being painted. Completed shed minus the doors. A total of 8 shelves were made. I added a 3/4" strip of moulding to the front of each shelf. While this was not necessary, it gives the shelves a neater look. Each of the shelves were nailed into place with 2" nails right into the 2" x 4"s.
The photo on the left shows the storage shed completed minus the doors. 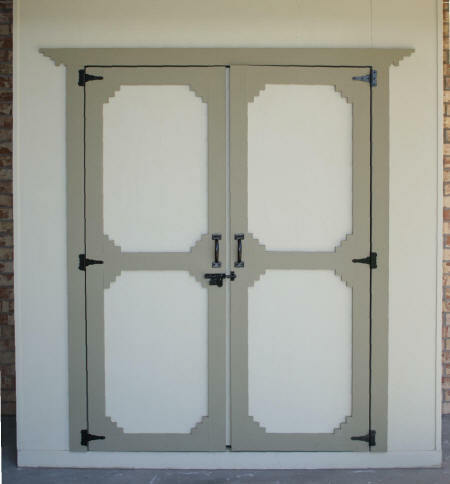 The doors are made but I am waiting for the hinges, which were ordered online. All of the shelves were installed and I have added hardware for the gardening tools that will hang. 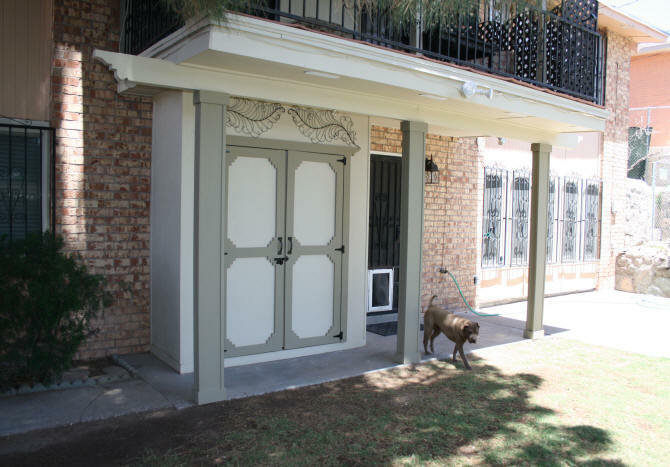 The door was framed with 1" x 4" white boards and painted a darker color. The photo on the right shows the shelving in a little more detail. The shelving is cut around and placed on top of the 2" x 4" on three of the shelf ends. The next step will be to install the doors. 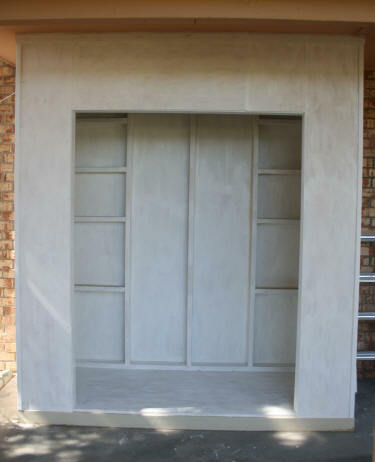 The frame of the doors is made out of 1" x 4" white board. 15/32" plywood will be added to the door frame. 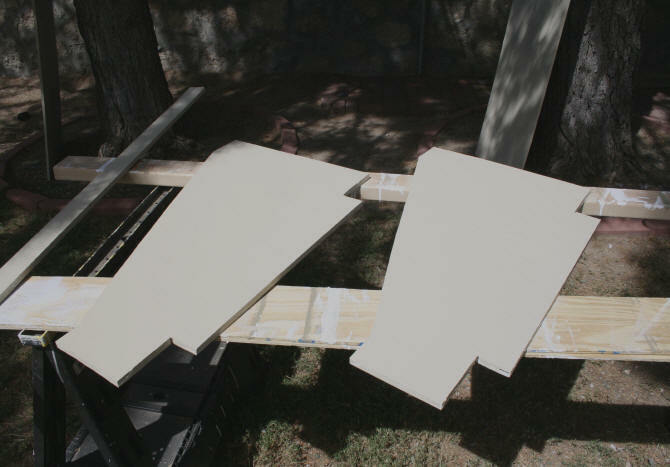 The door frame and body will be painted separately and then nailed together. The reason for this is two fold. 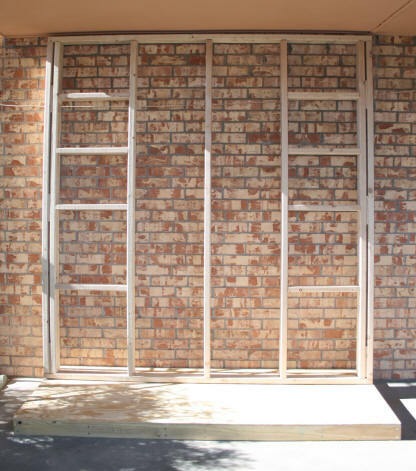 First, I want to hang the two door frames on the hinges without the full weight of the door with plywood. Hanging a door is always preferably a two person job. Not easy to do by yourself. The lighter the door, the better chance I have of getting the door hung right by myself. 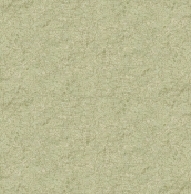 Second, the paint job is much neater looking when each section is painted separately. Also, the plywood under the frame will be painted and protected in case water works its way in the cracks. April 25 - 26, 2014 - My hinges arrived late in the day on the 25th. I really wanted to get the doors up by the afternoon on the 26th, because El Paso was expecting another very dusty windy day. As planned, I first attached the hinges to the frame and marked the door frames for the hinges. I drilled starter holes for the screws and hung the two door frames in place. After I was satisfied with how the door frames were hung, I removed the door frames. 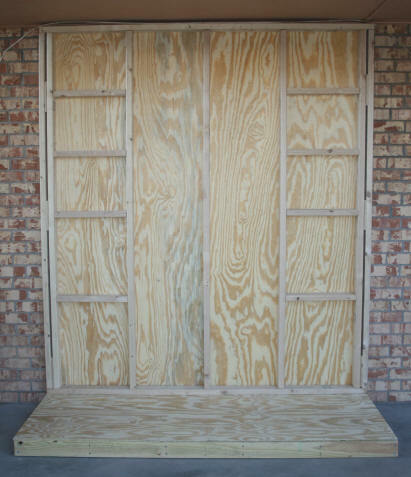 I then nailed the plywood on to the two door frames and re-hung the doors. Cutting with a jigsaw or band saw would eliminate these extra under cuts because the blade cuts straight up and down. The table saw for me, was just faster. The whole door frame was just glued together with wood glue on a flat surface. With the Southwest detail wood blocks further holding the frame together. 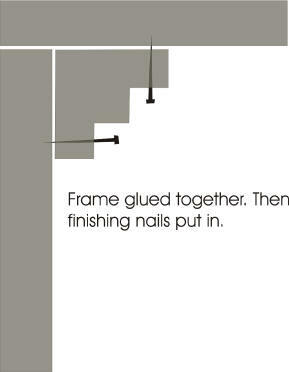 When the glue was dried, I added some finishing nails through the bottom step of the design. See graphic at right. I then filled the cracks with wood dough, sanded and then painted. I added a slide bolt to the inside top of the left door to lock the door in place. A latch and handles were added to the outside. In addition, I added some weather stripping to both sides of the door from an extra weather stripping kit I had used on the other outside doors in the house. See the weather stripping project for more information. 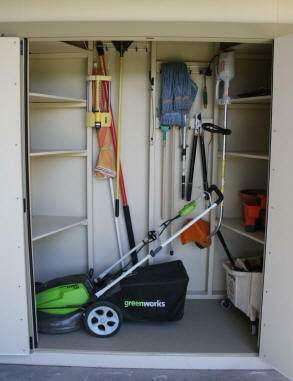 The idea is to make this shed as airtight as possible to keep the dust out. I will have to order another kit for a piece long enough for the top of the doors. The view of the shed at the left shows the right side of the shed. I added a decorative thermometer to the wall here. While I was waiting for the hinges to arrive, I started repairing the area around the shed. I also finished painting the ceiling of the patio area and surrounding cross beams. For the dog eaten columns, I will be covering them with PVC sheeting. Please refer to the column wrap page for this project. 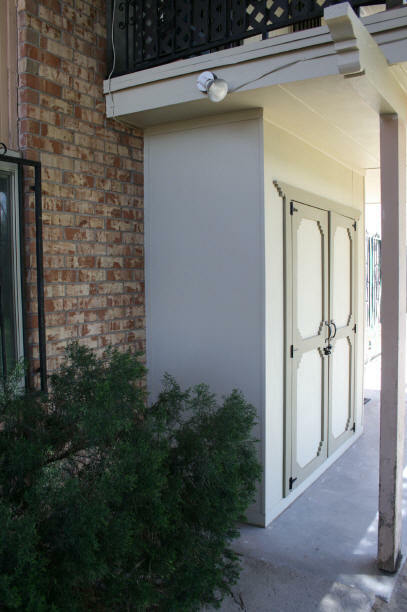 The photo on the right shows the storage shed on the left side. Remember this shed is free standing. The only thing that attaches it to the wall and ceiling is the caulk used between the moulding and surfaces. The paint gives it a more uniform look. Am I worried about the shed moving? Heck no, it is just too heavy. For the paint I got on the concrete, I did not worry about it too much. I have bought an anti-slip concrete paint to cover the concrete around the shed. The concrete here is dangerously slippery when wet. I will be painting the concrete after I finish all of the repairs and painting. So how does the shed look with stuff inside? See for yourself in the photo on the left. I still have to move more gardening items in here from throughout the house and the garage... after I find them all. So it will be pretty full when I am done. The total cost of this project, not counting my labor, was just under $500 dollars. Three trips to the hardware store and one trip to a paint store. 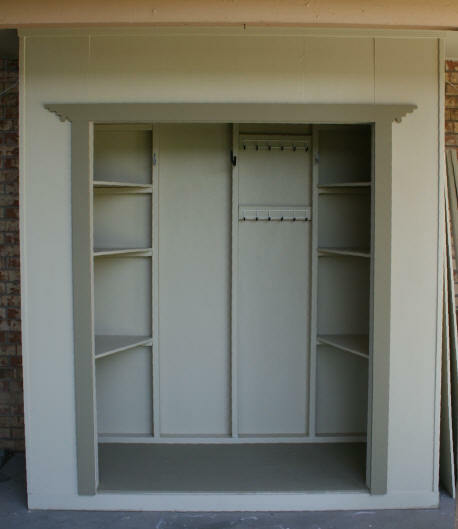 A little more than what I would of spent ordering a pre-made storage shed. With this shed I have the exact size and color I wanted. No unnecessary roof. And my shed looks like it is part of the house. And... I can proudly say....I built it all by myself!!! Shed with repaired columns. 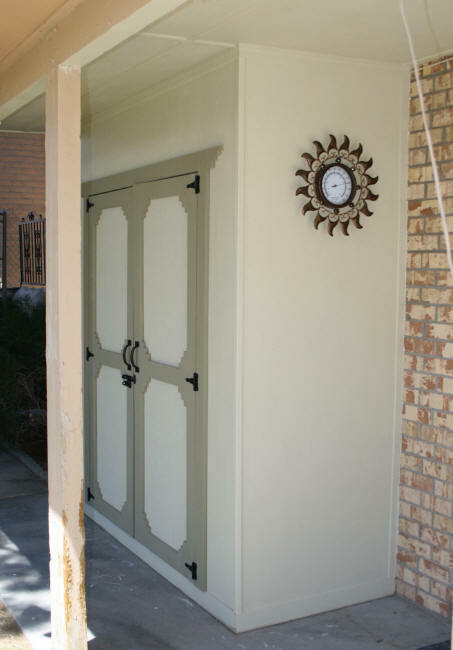 Decorative metal art added to top of doors.